'Whitewood', the Donald Scott Sr. estate built c. 1912 in Lloyd Harbor. Scott was a professor of anthropology and archaeology at Harvard University and along with 33 other individuals (including Franklin D. Roosevelt) purchased the New York Evening Post in 1922 (where Scott became a director). 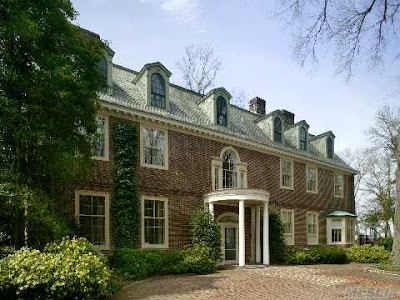 The estate was later purchased by Morris Hadley followed by his son John Wood Blodgett Hadley. The house and 55 acres is currently for sale for $21,000,000, click HERE to see the listing on Daniel Gale Sotheby's. Click HERE to see 'Whitewood' on google earth and HERE on bing. Although I would have preferred more symmetry for this style of house, it is a lovely home on a fabulous property. The guest house in the realtor's photo was, no doubt, originally the c.1912 garage and chauffeur's quarters. Do you agree with the attribution to S. White? Annual taxes of $281M? And I thought that I had it bad. I believe that the Hadleys, original residents of North Country Colony in Glen Cove, purchased this house in the very early 1950's, shortly after Webb Institute had taken possesion of The Braes, Herbert Pratt's former house next door. The Hadley's Glen Cove house was on a rather narrow and long piece of property, surprisingly close to the road. It must not have seemed intrusive with all the neighboring houses in private hands. It probably seemed unpleasantly busy with an active institution across the way. The Hadleys were clearly taking no chances in LLoyd Harbor with the Long Island Sound on one side and 50 acres or so to the rear. If you're interested in more on the Hadleys, read Michael Gross' very entertaining 740 Park Avenue. The Hadleys were long-time residents there, but as very blue blooded, understated Social Register types, preferred to use the building's secondary address of 71 East 71st Street. This is another case of a house being attributed to White from beyond the grave. I have no hard evidence of this in my possession so I cannot comment on the accuracy of the broker's claim. I add up the taxes as coming to a little over 325 thousand, still, not that I'll ever be able to afford that in this life-time. I bet that this beauty will be grabbed up by some developer. Not sure if I'm reading into things, or starting to see conspiricy therories at every turn. But it seems almost like the owner's of these homes set unbelievably high prices knowing that no one but developers would ever be able to purchase them. And these taxes!!! getting way out of hand. 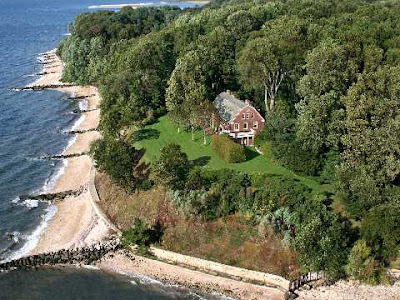 I really would like to see were all this money is going in both Nassau and Suffolk counties....as I said, Long Island is being offered to the Development Gods,and they will not rest until every piece of free space is built upon, and the last of these magnificant homes will be nothing but memories on this blog. 1) Very nice house, probably not Stanford White, so some other skilled architect should get his deserved credit. 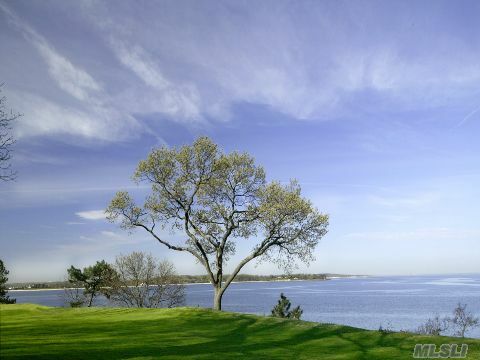 2) Is 'Whitewood' the current titleholder of the longest driveway on Long Island? I don't remember seeing anything previously posted & extant that can beat this drive. 3) At least if this property is ever subdivided (& we all hope NOT)the house is close enough to the water that it won't suffer the indignity others have experienced of seeing a 'new' house take over its view (assuming the house remains) -- it's sad when you start thinking in those terms. Thank you again, for doing this blog. And thank you 'Magnus,' for the book suggestion. a beautiful house in a beautiful setting. i can only hope i will be as productive after i die as stanford white was. a chance for brodsky to go 2 for 2. considering the slow real estate market, he should be able to sell enough of lands end to buy this place, pull the house down and build 50 or 60 pieces of crap here. first, he'll need to clear cut it. an awful lot of those messy trees there. security word def - "fanous" - not so well liked stars on facebook eg charlie sheen - meant as a derogatory as in "he's really fanous now"
UNFATHOMABLE the amount of taxes you guys put up with! Winfield Hall at $40 grand a month. I would expect streets paved with gold and a direct phone line to the mayor. 740 Park Avenue also has a interesting read about Marshall Field, his wealth, Caumsett and tragic family life. Follow the links to view application to put WH on the National Register of Historic Places. Side note from the above realestalker - yacht Vanadis built by C.K.G. Billings of Farnsworth fame. Later owned by William Harrison of Oak Point who renamed yacht Warrior. Later yet Barbara Hutton sailed the seven seas or was it seven husbands? Kean Development bought this property, hopefully they aren't going to destroy the main house and restore it but they are subdividing the 55 acres. I grew up on the Hadley estate in Glen Cove as my grandfather was the superintendent and lived in the gardener's cottage. In the spring of 1953, the Hadley's moved to 22 Lloyd Lane in Lloyd Harbor. The estate on Crescent Beach Road was offered to my mother and her twin sisters for 28,000 but my mother turned it down as the taxes were too high. My grandfather wanted me to grow up in a neighborhood where there were other children,so the Hadley's bought us a house in Huntington,and he drove to Lloyd Harbor daily.The Hadley's were very generous,letting us swim at their beach during the summer.When the estate was passed on to John Hadley,and then to his widow Robin,my mother and I went to this house in 2010 or 2011,and gave her photos of her late husband and family that I found in possessions I had since childhood.She was very gracious,and told me that the property was on the market. It was too much for one person to maintain,Though Mr. and Mrs. Hadley,my grandfather,and my mother have passed on,the memories of growing up in this environment will never die.